Tyler Glasnow is an American professional Baseball player who plays in the Major Baseball League (MBL). As of 2019, Tyler Glasnow currently plays for the Tampa Bay Rays as their Pitcher. Previously, Tyler Glasnow has played for Pittsburgh Pirates until 2018. As a Pitcher, Tyler Glasnow reportedly earns around $535 thousand as his yearly salary from Tampa Bay Rays. Further, Tyler Glasnow has an estimated net worth of over $3,000,000. 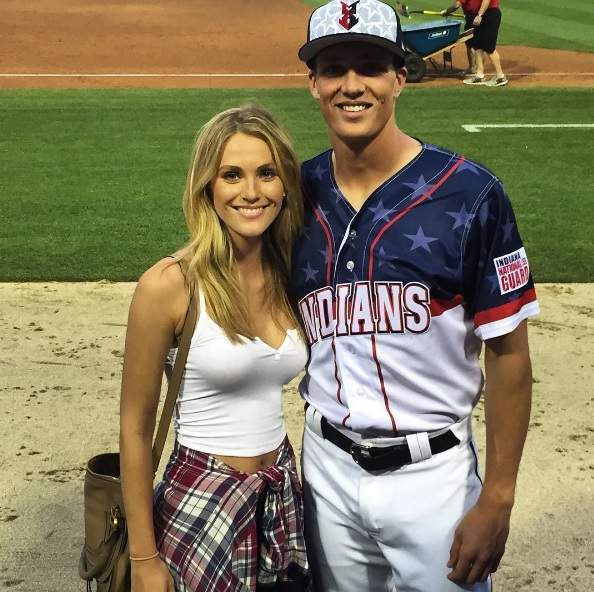 Glasnow is unmarried and currently in a relationship with his girlfriend, Brooke Register. Tyler Glasnow was born on August 23, 1993, in Newhall, California to parents Greg Glasnow and Donna Glasnow. As per his nationality, he is American and belongs to the White ethnic group. Further, his star sign is Virgo. He grew up along with his brother, Ted Glasnow. In Santa Clarita, California, Glasnow attended William S. Hart High School. He committed to the University of Portland playing college baseball. According to the reports, Tyler Glasnow is an open relationship with his beautiful girlfriend, Brooke Register. They are in a relationship for quite a long time. Despite being in a relationship for this long, their engagement news is not yet in media. Exploring Tyler Glasnow's social media, He sometimes uploads the picture of her. Further, Tyler Glasnow's girlfriend is a model by a profession. His girlfriend Brooke works as a fashion model for a New York agency who has done major campaigns for L.L. Bean and Belk among other companies, appeared on the cover of several European magazines. Beyond the busy schedule, Tyler Glasnow spends quality time with his girlfriend and goes to a different place for vacations. Last time they were spotted in Amsterdam. As of July 31, 2018, Tyler Glasnow has an estimated net worth of over $500 thousand which is exactly similar to Ross Stripling. He reportedly signed a contract with Tampa Bay Rays on July 31, 2018. Further, the MBL player has an average salary of $535 thousand annually. Tyler Glasnow so far has made earnings of $1,774,073 from his entire MBL career. He is also one of the players receiving a salary as a pre-arbitration player referring to his MLB service time similar to Zach Eflin. To be specific, MLB uses the salary arbitration system known as the last offer of arbitration, in particular. Under the current MLB- MLBPA collective bargaining agreement, players are subdivided into three categories: (1) pre-arbitration players ; (2) wage arbitration players; and (3) free agents. Further, an eligible pre-arbitration player typically earns around the major league's minimum wage in the first three years of service. Further, the famous sports athlete is associated with different endorsement deals through he earns decent money. The Pittsburgh Pirates selected Glasnow in the fifth round of the 2011 Major League Baseball draft. After playing for other smaller leagues, the Pirates promoted Glasnow to make his major league debut on July 7. After his shoulder injury, he returned to the active roster on July 23 as a relief pitcher. The Pirates decided that Glasnow would start the 2018 season as a relief pitcher during spring training in 2018. Glasnow was traded to the Tampa Bay Rays on July 31, 2018, for Chris Archer, along with Austin Meadows and Shane Baz.